PS â€” Take a picture of how you spent National Goof Off Day (or any of your personal Goof Off Days) with your copy of Banana Bamboozle. When I get some good ones, I’ll post on my blog. Email jpgs to Becky (at) Becky Clark Books (dot) com … do I need to tell you there are no spaces? I’m never sure. Thanks, downloaded, and I wish you all the best, with it, Becky! Now, go bamboozle someone else…. Thanks, Frank. 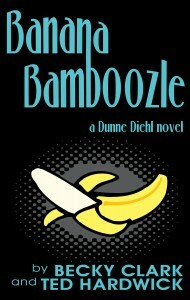 You’re sweeter’n a Banana Bamboozle!